Darylle Sargeant, from 2018’s Love Island, came to us back in July 2018 wanting to go through with our Tear Trough Filler Treatment. She had decided to go ahead with the treatment years of feeling insecure about this aspect of her appearance. She was looking forward to seeing the difference smooth skin under her eyes could make. 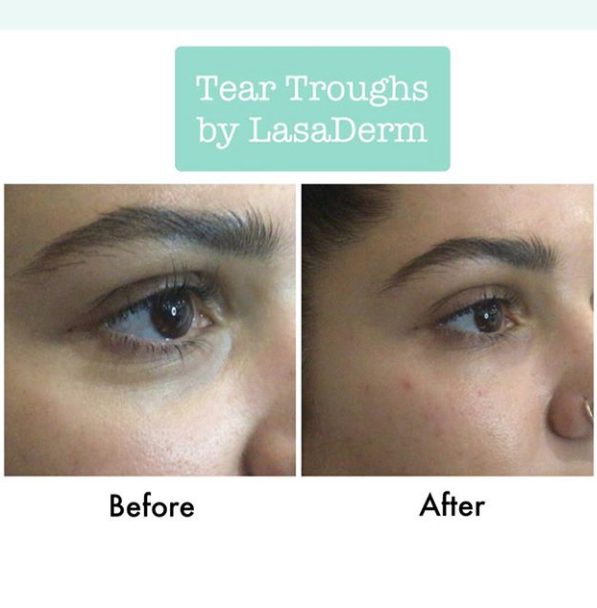 We used Dermal Filler Injections to treat the tear trough area. The injects are placed carefully just in between the muscle and the bone, helping to achieve a less wrinkled and smoother appearance to the under eye area. Our doctor used a cannula to provide an even finish, helping to avoid the chance of bruising. If you suffer from tired, sunken or hollow looking eyes, then investing in our tear trough filler is the ideal treatment to these problems. The procedure was extremely quick and practically ‘painless’ according to Daryl. The entire treatment procedure generally lasts approximately 20 minutes and requires no downtime afterwards. Daryl was perfectly fine to carry on the rest of her day without being affected. She was over the moon with the results and fed-back to us that she looked ‘5 years younger’ because of it. Make sure to watch the video below to hear her thoughts and feedback on the treatment, and to view the entire process.